Long before I ever visited the UK for the first time, I had already fallen in love with the style of the classic British Telephone Box. I don’t remember the first time I laid eyes on one, but I suspect it was probably in the slideshow of my Uncle’s European trip when I was quite little. Years later, I don’t remember much of that slideshow but I do remember being impressed with the sights of London. Whether or not I saw a British Telephone Box that evening, it was when the dream of some day seeing London began. It was a dream that gathered pace over the years as I absorbed various aspects of British culture. When I finally made the leap, it became a rapid-fire chain of trips where I visited the UK five times in the span of only a few years. Since then entirely too much time has passed but I still dream of not only seeing London again but the rest of those wonderful places I’ve seen and the ones I still dream of seeing. 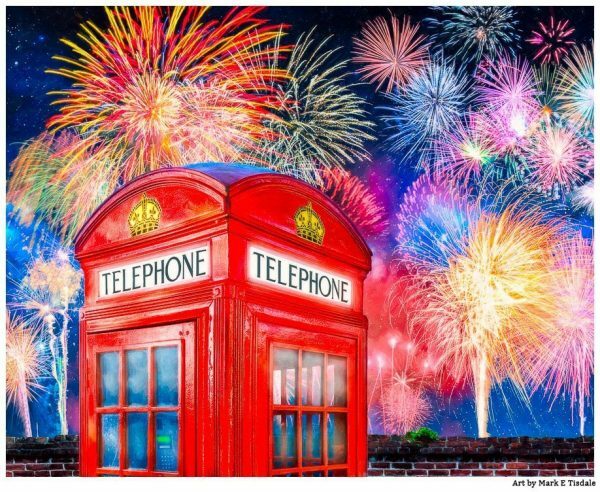 So in some respect, I think this brilliant view of a classic British Telephone Box with fireworks exploding overhead is my love letter to Britain. It expresses the wonder I have for British culture as well, of course, as the desire to go there again. Chances are if you are looking at this particular piece of art, you have that same connection with all things British that I do? 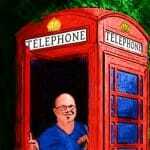 I intended this particular British Telephone Box artwork to have an anywhere-Britain vibe to it. That’s why there’s no clearly recognizable landmarks in this print, just an iconic Telephone Booth that could be in any British city or village. But for those who are curious, it is modeled after photos from the streets of London on one of my trips there and it’s an example of the classic design of the K2 Telephone Kiosk. I would love to hear what nostalgic memories this brilliant British Telephone Box art stirs for you? I do hope you’ll take a second to share your thoughts.